With classic 1950s style, this cascading pearl and crystal floral hair comb will adorn your hairstyle with vintage elegance. An exquisite vintage inspired delight from the 1950s era of stars such as Audrey Hepburn and Marilyn Monroe, Cascades of Pearl Hair Comb is the epitome of elegance. 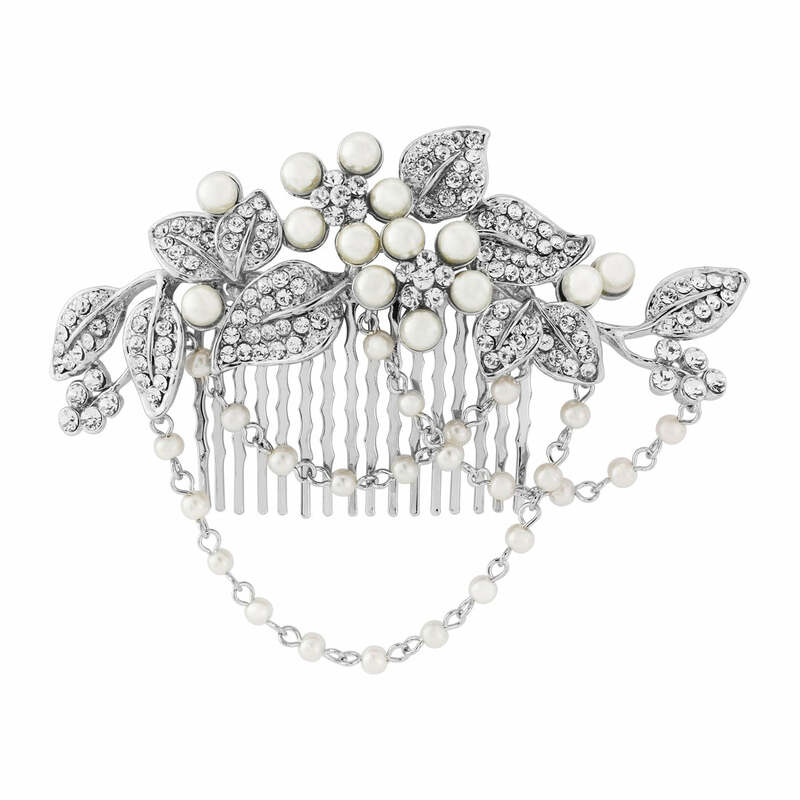 Featuring jewel encrusted leaves featuring petite clear Austrian crystals surrounding two ivory pearl flowers with sparkling floral centres, the resounding beauty of this comb is the three delicate silver tone chains interspersed with ivory pearls which are attached in loops from the trailing leaves. Intricate and incredibly beautiful, Cascades of Pearl will sit oozing Movie Star glamour at the side of the head against sleek backed hair or sitting above an elegant chignon with its strands delicately nestling against your gathered locks. 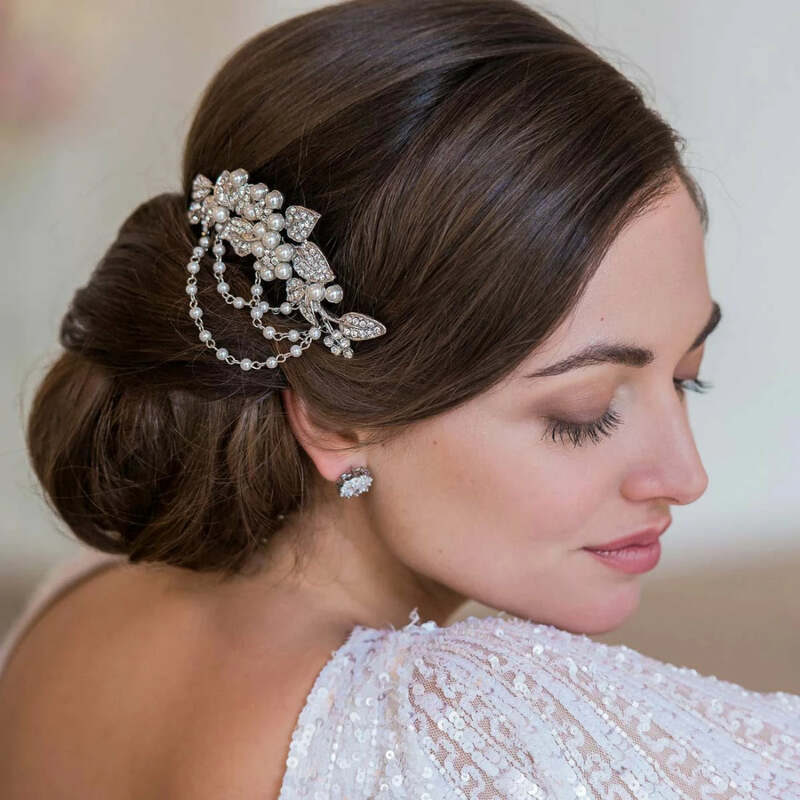 An enchanting and versatile pearl and crystal hair comb which will look divine accessorising a floor length ball gown or dressing up a city sleek suit for an after work event. Fans of vintage bridal accessories will adore the prettiness of this dainty comb. Embrace its 1950s influences and team with an ivory tea length gown and a hand tied posy bouquet for a bridal style your guests will admire. For show-stopping glamour choose an elegant vintage gown and team with pearl drop earrings and a pearl and crystal bracelet.